Assassin's Creed: Altaïr's Chronicles is a prequel to the 2007 video game Assassin's Creed. It features two new cities, Tyre and Aleppo; and the three original cities, Jerusalem, Acre and Damascus; but does not include Masyaf. 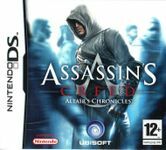 Unlike the original Assassin's Creed, the game is not told through the perspective of Desmond Miles, but rather the perspective of Altaïr Ibn La-Ahad, although the menu screens do take place in the Animus. Source: Wikipedia, "Assassin\'s Creed: Altaïr\'s Chronicles", available under the CC-BY-SA License.